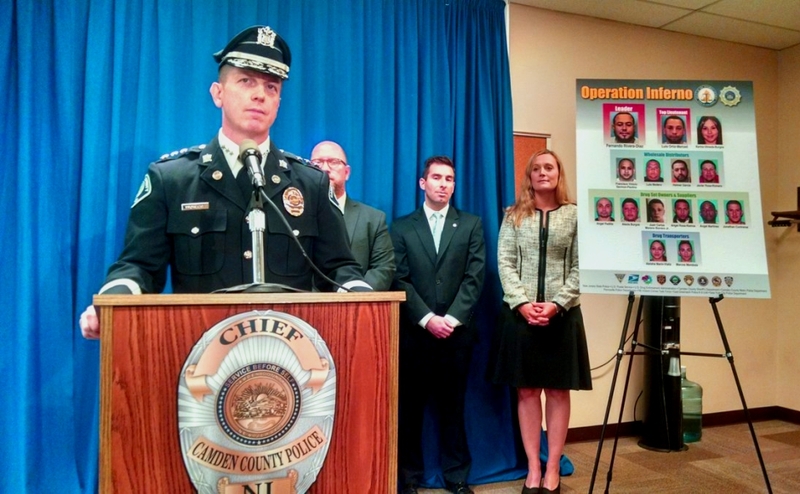 Camden County Police Chief J. Scott Thomson announces a major drug bust. Credit: Matt Skoufalos. Police said Fernando “Gordo” Diaz-Rivera and 14 associates allegedly ran a heroin and cocaine operation that supplied the bulk of the region with drugs tied to Mexican cartels. NJ Attorney General Christopher Porrino. Credit: Matt Skoufalos. 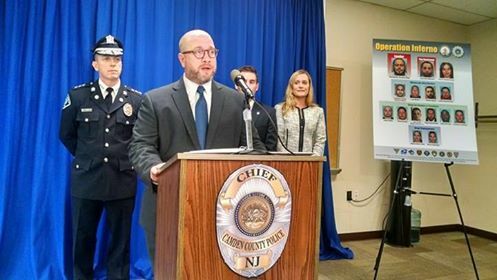 A seven-month multi-agency bust dubbed “Operation Inferno” because its alleged ringleader was “the hottest target we could get,” according to New Jersey Attorney General Christopher Porrino, culminated in the arrest of 15 men and women allegedly operating the largest drug in Camden City and North Philadelphia. 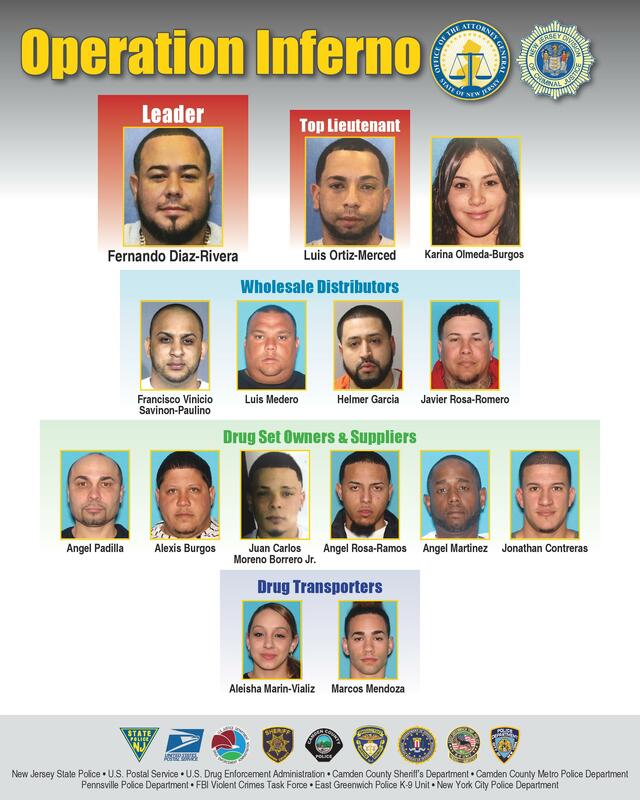 The top name on that list is Fernando Diaz-Rivera, 33, known by the alias “Gordo,” who is alleged to have distributed heroin and cocaine throughout the region via wholesale deals and independent drug sets. Camden County Police Chief J. Scott Thomson described Diaz-Rivera as a suspect who was “on our radar but off the grid,” and who is already in federal custody in Puerto Rico on a weapons charge. Porrino described Diaz-Rivera as one of the top suppliers of heroin and cocaine in the region, allegedly coordinating the movements of several wholesale distributors and drug suppliers through his alleged lieutenant, Luis “Moodo” Ortiz-Merced, 33, of Philadelphia; and Karina Olmeda-Burgos, 21, of Salem City. Olmeda-Burgos was Diaz-Rivera’s girlfriend, and allegedly handled the money from the network “in accordance with his directions,” Porrino said. The ring, which authorities said was tied to Mexican drug cartels, allegedly mailed millions of dollars of drug shipments into the region, or drove them by car from Chicago; as much as 30 kilograms of heroin and cocaine per month. The bust netted six kilograms of heroin and nine kilograms of cocaine valued at $600,000 wholesale or $2 million on the street, Porrino said. The suspects allegedly “used guns and violence and threats of violence” in the execution of the drug trade, Porrino said, adding that the investigation remains ongoing. Operation Inferno suspect chart. Credit: NJ Attorney General. In total, 15 people were charged with first-degree racketeering or narcotics offenses and second-degree conspiracy charges. Seven were charged with first-degree possession of narcotics with intent to distribute, and an eighth was charged with first-degree distribution of narcotics. Ten of the suspects were arrested yesterday and are being held in the Camden County Jail with bail amounts ranging from $250,000 to $400,000. Two are sought on warrants, and three were already in custody, including Diaz-Rivera and Ortiz-Merced, who is being held in Philadelphia on a weapons charge. Diaz-Rivera, whom Porrino described as “one of the top suppliers of heroin and cocaine in Camden and Philadelphia, if not the top supplier,” faces first-degree charges of leading a narcotics trafficking network, which carries a sentence of 25 years to life without the possibility of parole and a $750,000 fine. His arrest will contribute to “the dismantling of a drug trafficking organization that is going to help us at the local level increase the quality of life for people in our city,” Thomson said. “Open-air drug markets unfortunately negatively define the lives of the people that are there,” the chief said, describing an overdose trend that has claimed 70 lives in Camden City alone—80 percent of whom he said are non-residents. Porrino downplayed the prospects of a power struggle or subsequent violence to follow in the wake of the arrests. All persons charged with a crime are presumed innocent unless and until found guilty in a court of law. An arrest is not a conviction.